on Wednesday, 02 September 2015. Picture OneThe Medical Education Partnership Initiative (MEPI) has contributed to a PEPFAR goal of adding additional 140,000 health workers to Sub Saharan Africa (SSA) providing a structural support to attainment of PEPFAR’s ambitious goal of a generation free of AIDS. This was said by OGAC representative, Maureen Goodenow, while making opening remarks at the just concluded MEPI symposium held in Harare, Zimbabwe. Other speakers during the opening session included James Hakim, Chair PI Council who framed the conference, Robert Scott, US deputy head of Mission, key note speaker Amb. Eric Goosby from the University of California San Francisco and Holly Wong, the Principle Deputy Assistant Secretary for Health Global Affairs. Goodenowsaid that whereas a lot more needs to be done, the impact of MEPI on HRH is SSA will enhance the progress towards AIDS free generation. “There is a short window of opportunity to attain high impact on HIV Control, but this can only be achieved through focusing on the right things in the right places and right now”, she added. Control of HIV epidemic has been at the center of PEPFAR’s agenda and the fact that HIV prevalence in SSA is declining, the additional fit for purpose health workers that MEPI has help train will help in curbing the epidemic. Goosbydetailed the background of MEPI highlighted the need for MEPI to foster relevance of students within partnerships in their own countries to minimize brain drain. Platforms made by PEPFAR, he said, are sufficient to cover both CDs and NCDs which calls for integration of health services. The symposium entitled: “Sustaining MEPI Achievements: Leadership built, lessons learnt and partnerships created towards an AIDS free generation,” was held on the 14th -16th July 2015 at The Rainbow Towers Hotel, Harare. 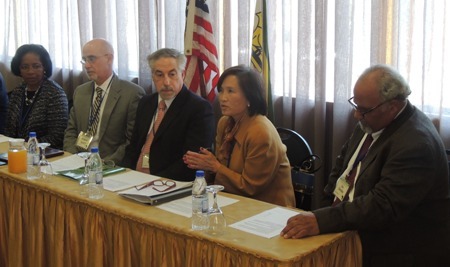 ACHEST, which is the African coordinating center for the USG-funded program oversaw the organization of the meeting that had over 250 participants. The Symposium Steering Committee was co-chaired by Francis Omaswa of ACHEST and James Hakim from the University of Zimbabwe. 12 ACHEST staff travelled to Harare to support the successful execution of the symposium. The participants, most of whom were doctors from the 13 MEPI universities and USG representatives, discussed the impact of MEPI on students and faculty, shared experiences and innovations in different areas to improve the quality, quantity of health workers, retain them where they are most needed and also improve locally driven relevant research maintain the partnerships that MEPI has supported their realization. MEPI is a five-year initiative (2010-2015) funded by PEPFAR through the Office of the US Global AIDS Coordinator (OGAC) and by the National Institute of Health (NIH) and Human Resources and Services Administration (HRSA). The initiative aimed to increase the capacity and quality of African medical education, improve retention of medical graduates and promote regionally relevant research in sub-Saharan African medical schools.